Showing 33 articles from January 2, 2014. LOUISBURG — A man arrested in a double-murder that culminated in his older brother dying in a police shootout is being held in jail without bond. District Court Judge Randolph Baskerville travelled to the Franklin County Jail on Thursday morning to administer Joey Kearney’s 96-hour hearing — a proceeding in which he was appointed legal counsel, Buzzy Gardner Jr. Veteran Franklin County Finance Director Chuck Murray has tendered his resignation after, “struggling and struggling” with the decision, he said. 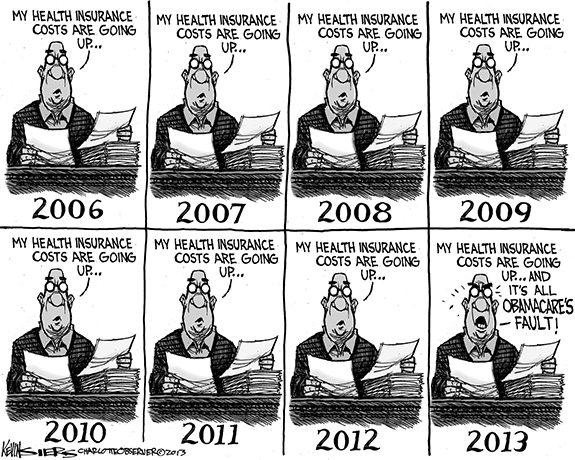 “This is a huge change,” he admitted. Murray, who held the high-profile county post for a little over 19 years, submitted his retirement/resignation letter on Dec. 31, to be effective on Jan. 31, 2014. 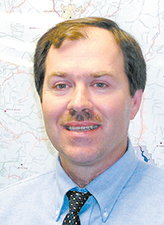 YOUNGSVILLE — Those who worked closely with Jeff Fields said the assistant fire chief rarely missed a call. 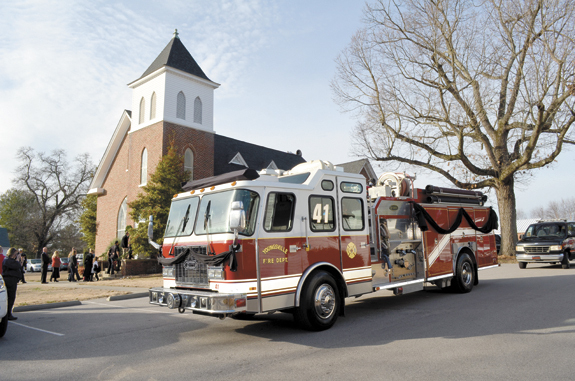 Last Saturday, firefighters from across the county and region answered the call, taking part in a funeral procession and service for Fields — who died from a health-related matter on Christmas Day. “Firefighters are part of one big family,” said Youngsville Fire Chief Tommie Lloyd, making note of the firefighters and others from Franklin and Wake counties that came out Saturday afternoon to lay Fields to rest. Ah, a new year and new challenges. 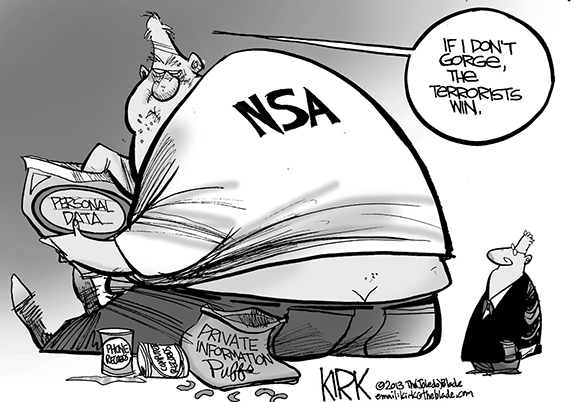 The year 2014 has dawned and, without pretending to have a crystal ball, there are some things we simply have to get done in the coming 12 months. Perhaps one of the most urgent tasks facing us is getting someone in Raleigh to listen to the need to improve U.S. 401 in our county. A swift kick in the rear first step to a new park? Dare we hope that Santa Claus brought ace Franklin Times reporter Carey Johnson a pair of steel-toed boots for Christmas? A heavy-duty and pointed toe pair of boots, perhaps custom-made for kicking? If you’re confused, let’s turn the clock back exactly one year, to the first edition of The Franklin Times published in 2013. It seems that the year 2014 will bring with it some things you can have. It’ll all depend on where you are. Based on some thorough research, I’ve come across these new laws for 2014, and some of the ramifications. A New Year’s ‘wish list’ better than resolutions? I have never been in the habit of making New Year’s resolutions – which is probably a good thing since I’d most likely break them – but since I started writing a few years ago, I do like to make New Year’s wishes for others. Lucy Allen: The enjoyment that comes with private citizenship and our thanks for a lifetime of service to your community. LOUISBURG —Funeral services for Akesia Michelle Jones Toney “Chubb”, 37, who died Tuesday, Dec. 31, 2013, will be held Sunday, Jan. 5, at 2 p.m. at Louisburg High School Auditorium, with the Rev. Douglas Harris officiating. Burial will follow in the Wright family cemetery. LOUISBURG—Funeral services for Brianna Nicole Jones “BeBe,” 16, who died Tuesday, Dec. 31, 2013, will be held Sunday, Jan. 5, at 2 p.m. at the Louisburg High School Auditorium, with the Rev. Douglas Harris officiating. Burial will follow in the Wright family cemetery. FRANKLINTON - David Alva McKinney, born February 1, 1957, died December 25, 2013. He was a superior fisherman and hunter of the highest caliber. A father of few words and a large heart, one whose words of wisdom, fortitude and constitution will not be forgotten by those who knew and loved him. PAMPA, TEXAS—Nicholas Clyde Nelson, 28, died Dec. 28, 2013, in Pampa, Texas. SHUTDOWN DEFENDER. 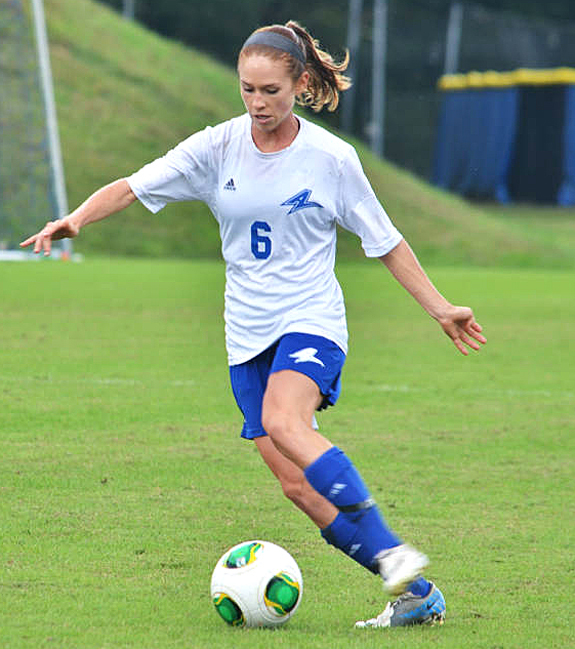 Shaylyn Poppe (right) was an outstanding defensive player during her eight combined seasons as a member of the soccer teams at Franklinton High School and Gardner-Webb University. FRANKLINTON -- Eight years later, on a chilly night in the tiny town of Boiling Springs, everything came full circle for Shaylyn Poppe and Amanda Knapp. Back when they were friends and soccer teammates at Franklinton High School, Knapp and Poppe promised that the circle would be unbroken. SIMPLY UNSTOPPABLE. 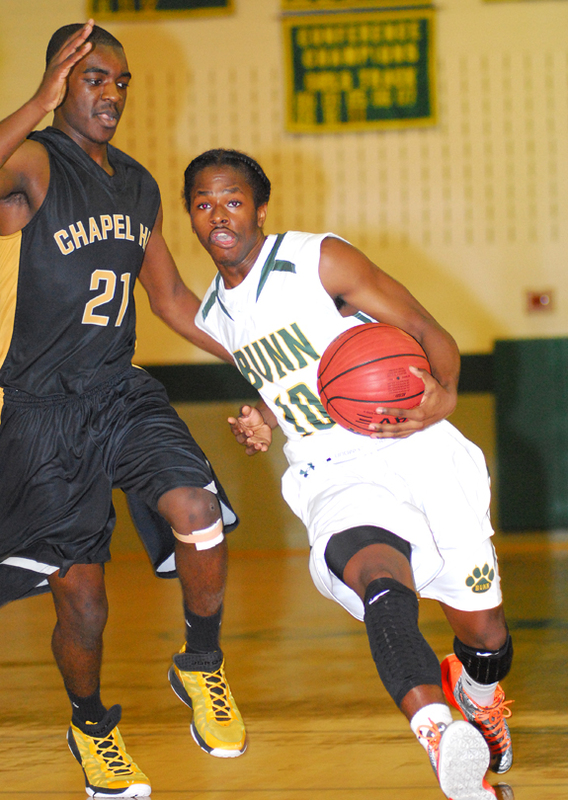 Senior guard Deshawn High has been strong this season for the Bunn High School boys basketball squad. 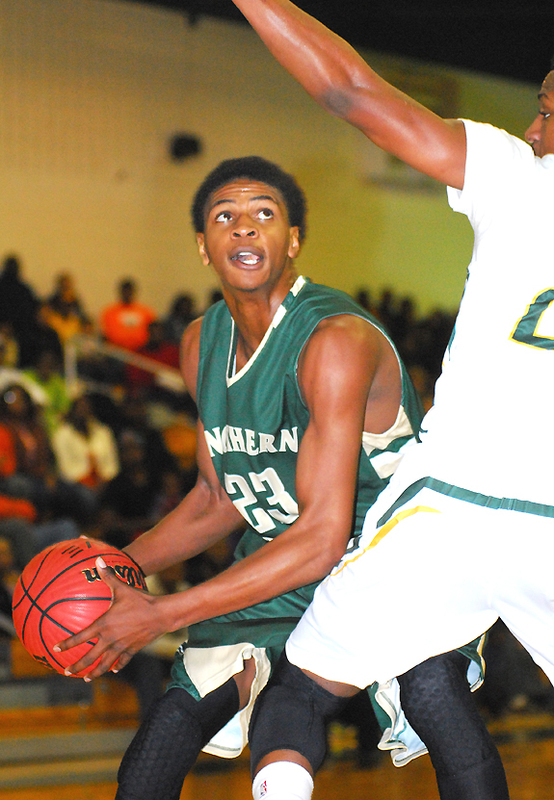 BUNN - Two strong halves of basketball -- albeit on different nights -- helped propel the Bunn Wildcats to the championship at the Bunn Christmas Tournament. The Wildcats saved their best for last in both the semifinal and championship at the event, which concluded last Saturday at the Bunn Dome. PRECIOUS IN THE PAINT. Bunn sophomore guard Precious Walker scores inside during last week’s action at the Bunn Christmas Basketball Tournament. BUNN -- Much of the pre-event hype for the Bunn Christmas Basketball Tournament centered around the Riverside Martin Lady Knights, who brought an undefeated record -- and one of the state’s top freshmen -- to the Bunn Dome to tangle against some high-level competition. Riverside Martin lived up to its lofty expectations by rolling through a pair of tourney conquests -- both by 20 points or more. 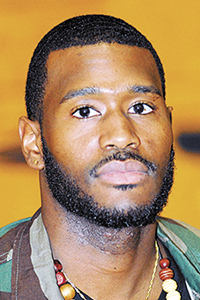 BUNN -- For one half, the Northern Nash Knights stood toe-to-toe with the host Bunn Wildcats during last Friday’s opening-round action of the Bunn Christmas Basketball Tournament in Franklin County. 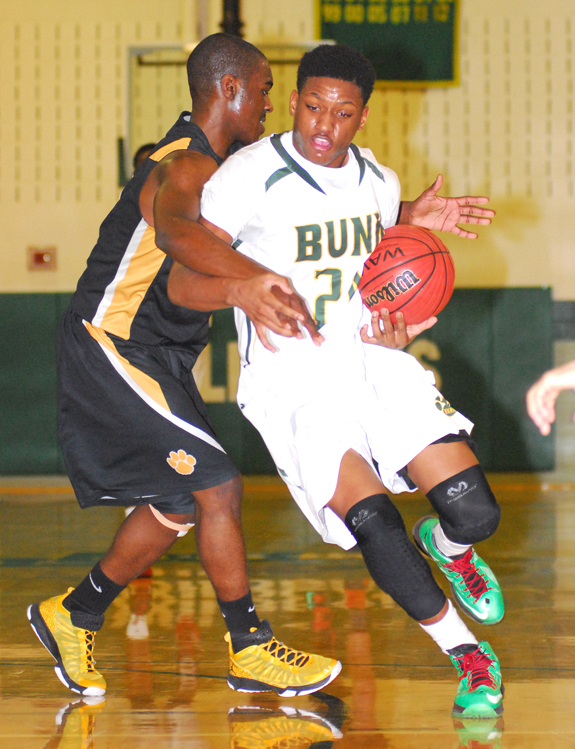 But the Knights couldn’t jump into the victory column down the stretch as Bunn pulled away for a 64-34 conquest. For NNHS head coach Rick Ruffin, inconsistency has been his club’s main issue this season. Franklinton at NCSSM 6 p.m.
Southern Vance at Bunn 6 p.m. STEM -- Louisburg High School went one up and two down during last week’s action at the Granville Central Boys Basketball Holiday Shootout. The Warriors, coached by Dontae Lassiter, got off to a strong start by defeating Woods Charter School by a 74-35 margin in the opening round. CHAPEL HILL -- Wells Fargo, along with the North Carolina High School Athletic Association, has announced the final standings in the Wells Fargo Conference Cup competitions for the 2013 fall sports season. The Wells Fargo Cup Award recognizes the high schools that achieve the best overall interscholastic athletic performance within each of the state’s four competitive classifications. 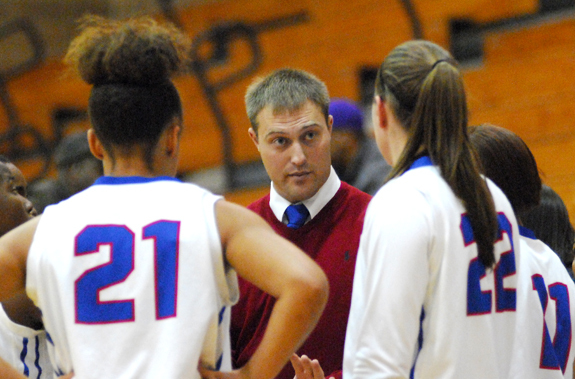 Former Bunn High School girls hoops skipper Benj Daniels is now in his first season as the head coach at Wake Forest HS. Daniels and the Lady Cougars are 4-7 overall after splitting a pair of contests earlier this week at the Wakefield Basketball Tournament. Daniels is shown talking to his team during a setback against Northern Nash. 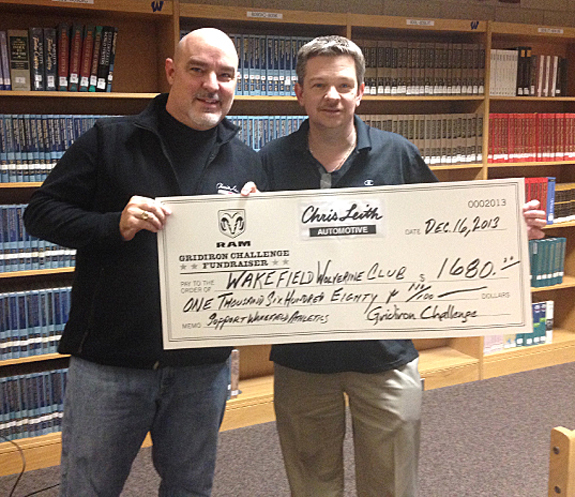 Driving rain did not stop families and fans from participating in the Ram Gridiron Challenge Fundraiser on November 1 for the Wakefield High School football program. Ram Truck brand contributed $20 for each test drive of the 2014 truck of the year – Ram Truck. GREENVILLE -- The East Carolina University baseball program will conduct three youth clinics in January. • A Hitting Clinic is scheduled for Jan. 12 from 1-5 p.m. Cost is $85 per person, and the event is open to ages 10-up. • A Pitcher/Catcher Clinic is slated for Jan. 18 from 10 a.m.-2 p.m.
Nobody has scored more goals in the history of Franklinton High School girls soccer than Amanda Knapp. 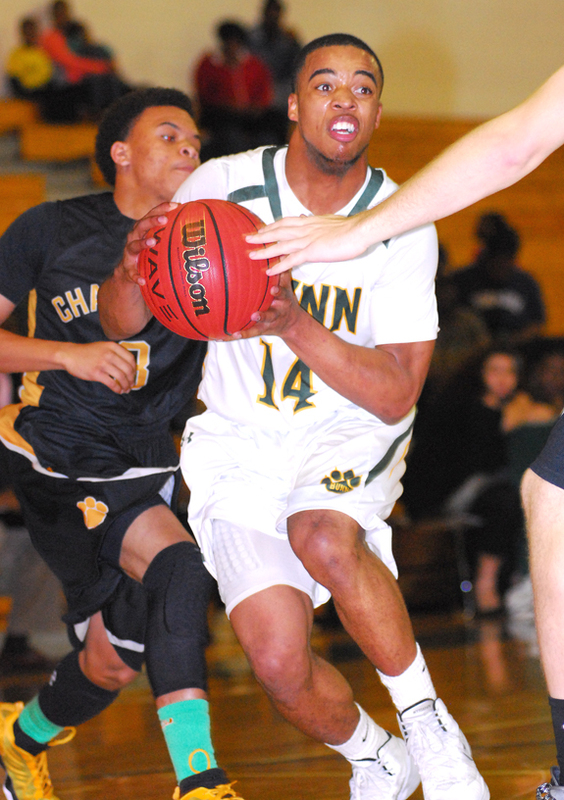 Bunn’s Aaron Simmons heads to the hoop last Saturday night against Chapel Hill High School. Riverside Martin’s Takwana Bland (right) drives to the basket while being defended by Bunn’s Jayla Cofield in the championship matchup of the Bunn Christmas Basketball Tournament. Bunn’s Malik Finley (right) drives to the basket during last Saturday night’s victory over Chapel Hill in the finals of the Bunn Christmas Basketball Tournament. RALEIGH — Two Franklin County groups intended to open charter schools in 2015. By the December deadline, though, only Larry Henson had filed a formal application with the State Department of Public Instruction to open his Youngsville Academy. Franklin County Commissioner Sidney Dunston did not file a formal application on behalf of his God’s Vision Ministries to open a school called F.I.R.M Foundation. With her daughter, Courtney, holding the Bible, Dr. Lisa Martin (left) takes the oath of office to become the new superintendent of Franklin County Schools on Thursday morning. 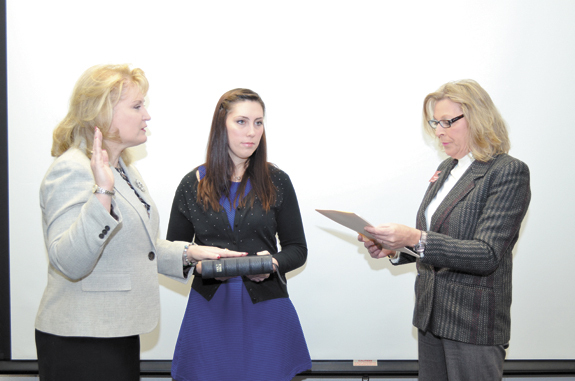 Administering the oath was Franklin County Clerk of Court Patricia Chastain. Dr. Martin, who was hired in late November, replaces Dr. Randy Bridges who had been serving as interim superintendent after Dr. Eddie Ingram resigned from the post last summer to move to South Carolina. Heavy storms and the inflow of stormwater are being blamed for two holiday season sewer spills. According to Franklin County public utilities staff, the Dec. 29 spill was reported at a pump station on Chavis Street in Franklinton. More than two inches of rain fell that morning, causing an estimated 600 gallons of untreated wastewater to enter into a tributary off Ceder Creek, which is located in the Tar River Basin. YOUNGSVILLE — A family victimized by a home invasion helped deputies arrest one suspect. 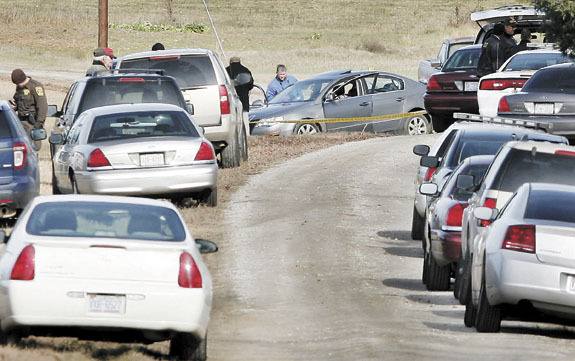 The second gunman was arrested 10 days later. According to a report by Dep. Stephanie Anders, officers were sent to a home on Cureton Drive where a home invasion was reported the evening of Dec. 11.